How fab is this necklace? Correct answer: SUPER fab. It was gifted to me by the brand LYLIF which sells chic clothing, jewelry, and accessories at a reasonable price. Thanks, LYLIF!!! Aw that dress is too cute! Love it. Such a cute dress. Love the layering. SO cute! 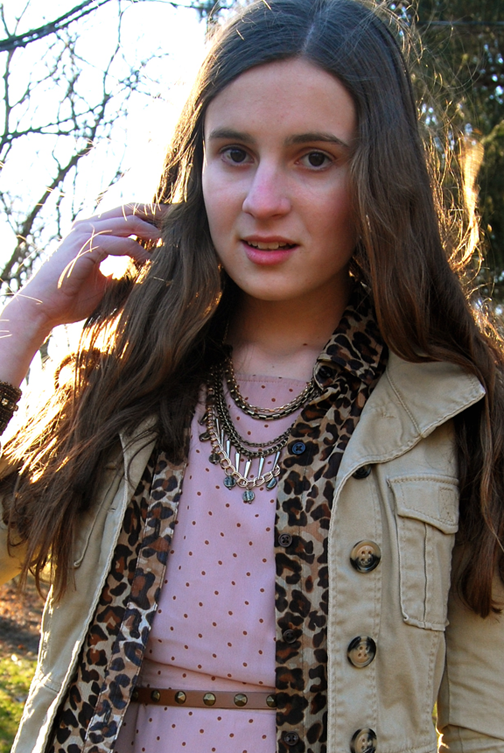 The combination of the tan jacket and leopard blouse is perfect! So pretty! We really love the way you've mixed the prints! Amazing look! you are always so good at pattern mixing! Haha and no, I didn't buy that jacket ;) I would have LOVED to, but it was 800 euros, even though it was on sale. Too bad! The dress is sooo cute, and it goes really well with the trench coat, and somehow you have made leopard print look awesome! Very few people can get away with it... kudos to you. Nice outfit. I like the combination of things you've put together. Very pretty! Love the pink with the leopard. waaah! love this outfit! it is seriously such a perfect combination of chic, bold, with a bit of an edge! Hy! nice post, check my blog and follow me if you want! You look very lovely dear! Such a nice look! Like your style! I love your dress - it's so cute! I love the patterns that you layered here! Wonderfully done! Love the studded belt with such a girly dress...such a pretty look. You are asbsolutely adorable! I like this outift ;D! Gorgeous, love the animal print peeping out! Love the leopard touch on your outfit and the necklace is totally fab. i'm glad they gave you the necklace, cause it looks fab on you! Love how you styled the necklace! Thanks for including us in your post!! Woww you look great! Nice post! Following right away. love your blog!! great outfit!! love the mix of colors and prints. I love the layering that you did in this outfit!! the leopard and cargo over it look great together.